Due to the recent number of attacks to the site and the unwelcome posting of links to pornographic sites, only site members can write comments to the blog and they will be seen by me first before they appear on the site. My apologies for any inconvenience caused. Happy New Year to you all. Life and work has been very hectic lately, hence nothing on the site since November! Hope yopu all had a wonderful Christmas and that you all have a prosperous New Year with lots of painting time. Not much hobby related in my stocking this Christmas.....the Pawly book on the Red Lancers and the DVD set of the Tv miniseries Pacific. Both are excellent! Don't know when my paint brushes will be deployed again, not too many windows on the immediate horizon. Plus I am suffering from tennis elbow in both arms! No, I don't play tennis! I always thought of this condition as being a bit of a joke injury bit OMG does it hurt!! Not sure how I got it but it really is an uncomfortable and painful affliction that can take quite a long time to right itself.......I've had it since April but it really took off in October. Combined with my palandromic rheumatism I am feeling very sorry for myself at present! Just when I thought I had managed to earmark myself a couple of painting sessions this week, it all goes Pete Tong!!!! My six year old son manages to break his foot and I'll have to take care of the poor wee thing all week now instead of him being at school allowing me some brush time! Bless him, he was as brave as a little trooper throughout our statutory 3 and a half hour visit to the hospital, not a word of complaint. It just means a little more time will elapse before the mameluke gets some attention. Oh well, a few more episodes of Star Wars, The Clone Wars won't do me any harm! We'll cuddle up on the sofa and see how Annakin Skywalker gets on against the bad guys! No doubt I will also be having a lot of Lego time too! Have found myself another "must have" figure! I hadn't really paid much attention to Studio McVey figures simply because I havn't had much idle net surfing time, but when I did pay their site a visit I found a great little futuristic street surfer type gal. Have linked the site below and go check out the paint job on Al Vianna, simply glorious. Had a few more small sessions on the Perry mameluke and he just doesn't seem right to me. I am happy with the colours that I've used and the standard of painting, the sculpt is quite nice.....but still he isn't filling me with boundless enthusiasm!! I can't put my finger on it but he is definately lacking something. Maybe when he is actually finished I'll be a bit happier but it is a strange feeling looking at him and thinking that he just isn't sparking. I will persevere with him, hopefully with a couple of sessions this week. Not sure what to do next. I feel the need to have a go at something a bit different....maybe Lilith Hesporex, the GW Dark Eldar recently released, or perhaps treat myself to the Darksword Steam Punk lady shown below. They both appear to have excellent faces and I do feel that I havn't managed a decent face for a while now. I also have a few other non-military figures languishing in the cupboards that should really be attempted one day! I was talking to someone the other day who asked me how I displayed my figures at home. Er...well....I don't actually, once finished they get put into a box and put in a cupboard! Every now and again I'll get a box out and have a little look and away they go again! I wrap them up in bubble wrap and stack 'em up a bit so there are many figures that havn't seen the light of day for years as I can't be bothered to unwrap and wrap up again! So why don't I sell some of them? Firstly, I don't think many people would actually want to buy them and secondly.....I have spent so many hours on them I just don't want to let them go! I have given a few away to people......the first General Colbert I gave away and now really regret it as I miss him somewhat!. I was offered a large sum for the Chasseur a Cheval officer by Foundry but declined as he is one of my favorite pieces. Every now and again I see a figure and get an instant "must have" moment. This is the latest figure to catch my eye. I have made a little start on the mameluke that comes with the mounted Napoleon group by Perry Miniatures. I added a moustache to the figure and intend to paint him up as a member of the Guard and not one of Napoleons aides. One of their better castings actually and a chance to go a little mad with colours. I am in two minds as to whether to put any fancy freehand embroidery on the uniform, quite a few of my references show black designs on their tunics. I'll wait and see as the figure progresses. Am also considering what colour horse for him. I prefer the ease if a simple bay colour but am very tempted to do a dappled grey mount....I have a few ideas for this and really do need to practice this type of colouring. So far I have done his face, fancy red voluminous trousers and yellow tunic. It's been a while but finally managed some painting time, then photography time and computer time! A rare run of hobby related activity. Now the General Colbert figure, I really enjoyed painting him but am I glad that I decided to practice on a few other figures before I tackled him?! Quite a tough sculpt, lots of detail but a few flaws aswell. The chinstrap and face let the figure down a bit....he could so easily have been a real classic figure in the same vein as the Perry sculpted Foundry Chasseur a Cheval figure, possibly my all time favourite figure. The pose and action on the Colbert figure is really good and it does have the air of being something really special....but he just doesn't quite make the "classic" league for me. Now don't get me wrong, he is an excellent piece of work and will be galloping across many gaming tables. I am merely being mildly critical of a few niggly points that spoil a very nice piece. I have prepped Perry mounted Napoleon and Mameluke figure as my probale next ventures. Sadly, Napoleon also suffers from a touch of bad casting on the hand holding the telescope. Again, a good figure spoiled slightly by casting. Now with the mamluke I can go wild with the colours! Yellow, green, purple and red! Maybe some fiddly freehand bits....oh and I have added a green putty moustache as he isn't going to be one of Napoleons' personal servants. Also catching my eye is a Perry mounted French colonel figure that I might just do as being from the Neuchatel battalion.....very yellow! .......when parcels arrive?! Yesterday the book I ordered for my own Christmas present arrived and I managed a sneaky flick through it before Mrs Hussarbob could confiscate it! I'd forgotten how interesting and comprehensive it was, so I am already very happy with my Christmas present! 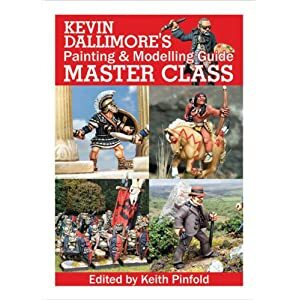 Today another large parcel arrived and it turned out to be Kevin Dallimores new book! Luckily, part of the deal when I agreed to paint something was that I get a free copy. I had no warning that it was due to arrive so was very surprised and childishly excited when I found out what it was........and went straight to the page with my humble efforts on. Second surprise was that it is both Murat and Ney in there! My 15 minutes of fame has finally arrived. Hopefully it will be something that my kids can look back on one day and remember that I wasn't just a nagging old Dad! I still have the two figures so maybe they'll be proud to have those aswell. Click on the image to be taken to Amazon UK site.......and "no" I don't get any money from sales of this book!!! It really does come earlier every year.....or is it just another age thing that I am no longer immune to?! So I have done my usual trawling through Amazon to find a book to buy myself and then dutifully hand over to be wrapped and given back to me on Christmas morn. 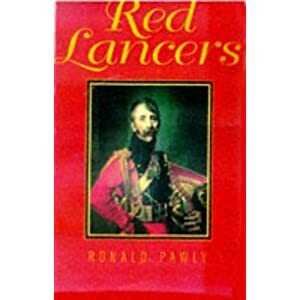 This year I have gone for Pawly's Red Lancers tome. I have had the book in my hands a few times and always decided not to get it but as there is nothing else catching my eye this year (well within price region anyway) I decided that I would go for this one. The Red/Dutch lancers have always been an interesting regiment and it's quite an in depth book with plenty of detail regarding make up, campaigns etc. Also a few nice little potted biographies re: some of it's members. Overall a nice little book to add to my collection. I'm sure it will get read one day...........I'm still working my way through Anatomy Of Glory that I got two Christmas' ago. Of course while I was ordering I just had to get myself a little something to keep me going until Christmas! And I had to stop myself from buying a couple of Franco-Prussian War uniform books aswell. I need help!! I also noted that you can purchase some of Mr Courcelles originals from The Red Lancer website....a mere $950 and upwards.....although sorely tempted, I did resist. Here's a link if you fancy some major retail therapy.